But now Microsoft is working on a system they call PocketTouch. 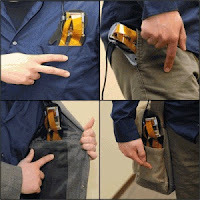 A multitouch detection system that can work even though thick fabric and will ultimately allow you to operate your smartphone even when place in your pockets - or inside a protective cloth bag. You don't even have to worry about remembering which position its in, as the unlock gesture will automatically "align" it in order to properly recognize the following gestures.